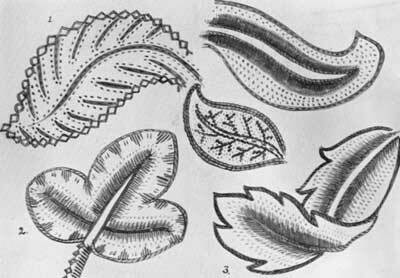 Today, I’m going to point you to a resource for free Jacobean embroidery patterns and fillings. I’ve pointed out this free online embroidery book before, but it’s been a few years, and many of you might not know about it. 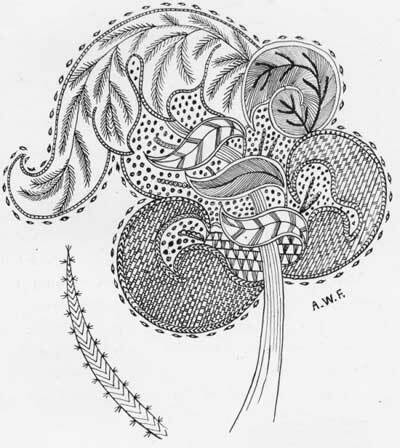 I’ve been playing with Jacobean Embroidery: Its Forms and Fillings by Ada Wentworth Fitzwilliam and A.F. Morris Hands lately. I’m not working up anything particular to embroider. It’s just that I really like the drawings in this book. It’s a great book to browse through if you’re trying to develop ideas for your own approach to a Jacobean-type piece of embroidery. Keep in mind that, although we often associate “Jacobean” embroidery with crewel work (which is wool embroidery) or with 17th century stitching techniques, Jacobean embroidery does not have to be worked in wool at all and it is not a stitching technique. “Jacobean” is a style (associated with the look and design of things). If you think of particular embroidery techniques, you’ll find that many techniques dictate the type of materials and stitches you use, to achieve the results of that particular technique. So, explore Hardanger embroidery, and you’ll find you need to use even weave fabric and usually tightly twisted, non-divisible threads and a certain set of stitches. Or explore Mountmellick Embroidery, and you’ll be told that Mountmellick is worked with a specific set of materials: white cotton sateen fabric and non-mercerized white threads, with a certain set of stitches. Explore goldwork and you’ll find specifics there, too. So techniques often dictate materials used and it definitely dictates stitches used. But styles (i.e. design styles) don’t. Jacobean refers to a style, a look typical of the Jacobean era (early 1600’s) in England (named after James I, or Jacobus, which is Latin for James). Jacobean styled embroidery can be worked in any type of materials that float your boat, with any type of stitches that float your boat – as long as you aren’t trying to be historically accurate. So, for those who are inclined to think 1. that Jacobean work is always done in wool; or 2. that crewel work is always Jacobean in design, or 3. that a Jacobean design must be worked in stitches typically used in the 17th century in order for it to be “Jacobean,” just remember that Jacobean ≠ crewel necessarily, and crewel ≠ Jacobean necessarily. Crewel and Jacobean are not synonymous terms and they can’t be used interchangeably. Also, remember that Jacobean ≠ 17th century stitchery, necessarily. For those of you who like the look of Jacobean design, but prefer working with modern materials (stranded cotton, stranded silk, beads, etc. ), or don’t like working with 17th century stitches, don’t worry! Don’t be intimidated into thinking that if you’re stitching something Jacobean, it has to be worked in historically accurate materials, or in historically accurate stitches. It’s just a style. You are perfectly free to mimic it and interpret it and modernize it in any way you want to. Keep in mind, I’m not talking specific 17th century stitchery here. If you want to do historical replicas of embroidered objects from the 17th century and you want them to be accurate, sure, you have to conform to a set of previously determined (by history) stitches, colors, and materials. But if you’re just taken with the style itself, you’re free to do whatever you want with it! 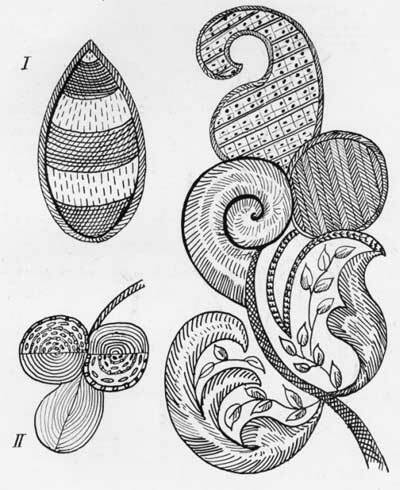 So, if you like the Jacobean look and want to do a little playing around with it, browse through Jacobean Embroidery: Its Forms and Fillings. It’s free online at Project Gutenberg and available in many formats. I intended to have something else up for you today, but as luck had it, I forgot to upload it to my server before heading out. Blogging from afar has its disadvantages! But since this topic of “Jacobean” has come up quite a bit lately in discussions and e-mails and questions and so forth, I figured I’d point out this resource again for those of you who haven’t seen it, and clarify some points about what “Jacobean” actually means. If you have any questions, comments, input, suggestions, or whatnot, feel free to have your say below! Enjoy your weekend! I hope you get in a goodly bit of time with your needle and thread! Gee, come to think of it, I hope I do, too! Oooh – thank you for telling us about this lovely resource. I, for one, am glad that it became your accidental subject today. I adore the Jacobean style, and this book is delightful. I am glad you clarified what jacobean embroidery is. I always thought only wool. The designs are lovely . Love your daily emails. Thank you for showing me this book. I was one who had not heard of this before. Thanks so much sharing this. I have had this book for a while and I also like looking at the pictures. Some of the stitches mentioned I can’t find in books. I prefer Jacobean designs with silk on silk rather than wool. Mary, one question regarding the Elizabethan stitches book. I have not yet read the whole of the introduction and first part (only bits and pieces), but would love to know what the braid used in plaited braid stitch (p72-3) is and what needle one would use. It looks very thick. I have gone through the materials section but don’t seem to find this info. The stitches of plaited braid seem rather complicated but I would love to try at least one. Likewise, what gold thread is used on p 70 and p108. This is a great book! After seeing it on-line I managed to get a used copy on amazon for a couple of bucks. For anyone interested, BE CAREFUL, as there are newer reprints that don’t include the photographs and drawings. The used edition to get is the 1990 Batsford Edition. It really is a great resource for Jacobean – still wonderful after almost 500 years. I love your site and appreciate your free patterns but more so your fascinating info. I have printed several patterns in the past few weeks. I want to try some of the Jacobean embroidery and your information (King James, etc. ) is so interesting to me. I was a history major and of all things I studied English History;primarily the Tudors. I have always been a sewer, smocker, embroiderer. I don’t know what sort of thread to use on these patterns, though. Any suggestions would be greatly appreciated. I saw that one does not have to use crewel or wool. Is cotton ok? Thank you for the link to this! I am delighted as ever when you blog about crewel work, but must mention one common error re the description of the style as “Jacobean”. Furniture described as “Jacobean” is from around the time of the reign of James 1 of England, 1603 -1625. Crewel Work was still being embroidered in the Elizabethan style during the reign of James 1st. Contributors to Wikipedia have made some spectacular mistakes on the subject of crewel work, and even wrongly including a portrait of Peter Saltpepper in a silk and metal thread jacket as an example of crewel work, thus creating even more confusion. Jacobean Crewel Work is often described as being “misnamed Jacobean”. The style you reproduce in this article is “misnamed Jacobean” as it was thought to be connected to the time of the short reign of James 11, 1685-1688. However it is later, more usually Charles 11 or even William and Mary. You are correct about the style being named Jacobean in more recent times, but it should really be Charlesonean or “William and Mary”. I blame the Victorians for naming embroidery into categories, but this is another subject! I am writing a book which clarifies the evolution of crewel work, and have just returned from a research trip around Scotland. I have also been explaining the importance of exhibiting embroidery to castle owners. P.S. Irish Mountmellick includes many stitches used in crewel work and metal thread embroidery. Mixing techniques and materials is not a new thing, and many metal thread stitches are used on the 1650s altar frontal I am currently replicating with my study group. … and very passionate about crewel. Thank you for this post – and the very clear explanation about Jacobean vs crewel. Thank you Mary for sharing the Jacobean Book it is delightful. Being English I grew up seeing this work in various places and would like to have a go myself. I purchased Hazel Blomkamp’s book on your advice and love it. This is a particularly nice blog because you included so many types of needle work in your comments. Very timely topic! I’m in a crazy quilting round robin where we are using inexpensive gold trims, braids, beads, and threads to embellish blocks. We’re calling it Fool’s Gold work. Some of the participants have asked for their blocks to be done in Jacobean style, so it’s great to have this article to refer to. LOVE, LOVE, LOVE this. Did I say I love this. OMG. Thank you for broadening my horizons! 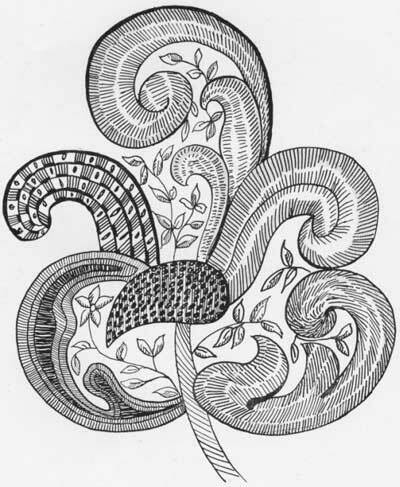 I really love the Jacobean – type of embroidery designs; the modern style more so than the originals. I believe the older designs are more of an outline with little to no fill in, is this correct? The prettiest samples are the ones which are very colorful with lots of stitch variety. Thank you for the inspiring article! This is great. I’m one of those who can’t get enough of anything resembling “Jacobean”. It has inspired me so much just looking at that book. Thanks again for all. Thank your for republishing the Jacobean web link. I spend a lot of time in your archives doing research and find so many treasures like this. But, please don’t be afraid to repeat or expand on previous topics. It is all good information and greatly appreciated! Just glancing through the illustrations reminds me a bit of the “zen doodle” books I have seen at the book store. I just have to send a thank you to you for the information that you provide us, everyday. You are a great wealth of knowledge and I am grateful to have found your newsletter! So funny that we both have Jacobean embroidery on our mind. I created and have published my Jacobean Fantasy 2013 calendar kit recently. I love the Jacobean style and had so much fun designing this calendar. I hope you’ll come and take a peek and let me know what you think! As I read your post and then some of the comments I was caught off guard by the information that Phillipa posted regarding the real dates for the Jacobean period. I also researched and only came up with the early 1600s. I look forward to reading Phillipa’s book regarding that time and to know the real dates that history relates to. Hi Waterose, I love the calendar! A perfect Christmas present methinks. I lectured with a timeline of crewel and other embroidery at the EGA National Seminar in San Francisco, and at Koala in Australia, 2010. I think everyone was too busy looking at the images on the screen! In the UK, the bed and the hangings are usually at least 100 years apart in age, and the bed is often described as “Jacobean”, even when it is Elizabethan. Confused? I have been trying to work all of this out for over 20 years and to timeline embroidery as much as possible. My information comes from written documentation within the British castles and country houses. Muncaster Castle has one of the best collections of crewel work I have found worldwide. The owners, a conservator and I are currently creating a textile exhibition room, plus improving two conservation and storage rooms in the attic. If anyone wishes to come to a conservation study holiday in 2013 then please let me know! Maybe we can persuade Mary to come and write a blog from a castle in the UK!? Does anyone know anything about German textiles please? I have just bought a piece of crewel work which may be German, but about which i know nothing. Phillipa….thanks so much for the compliment! Have you published any of your timeline? I hope you will have pictures somewhere when you get the exhibition room created. I imagine I will not get to England in the near future and would love to see what you have discovered. I’m a member of EGA…is your research located anyplace where I can read/see at this time? Thanks so much for this site. I will be using it often, I’m sure. Interestingly, the Athabascan beadwork used on gloves, sippers and other fine leather items has it’s origin in Jocobean style that French traders brought with them while exploring into Alaska along the Yukon — the seed beads are finely couched in wonderful and exacting rows following the curves of the design. They are renamed for local flowers and animal tracks, and have become a unique tradionion of their own. Ooh, luvly. With the stitches illustrated as they are, it’s kinda Zen Tangley, and very graphic designish. Could happily frame the illustrations to great effect. Thank you for this wonderful resource. Greatly appreciated. Ah, this is wonderful. I just did a class recently where we were making our own Jacobean samplers and had to create our own designs. This will be handy since I’m not super keen on the design I came up with. Hi, I can get to the site on Jacobean embroidery, but I can’t get it to download?? I have done Crewel kits but am enthralled with the Jacobsen designs. Wondered if you could tell me if I were to take the designs you showed and I did see the gutenberg ones on line also,if I made a picture that comprised parts of the designs,can I sell my picture? I see people have these designs pictures but the designs look the same,ie. The Jacobsen leaves, flowers,etc so I was wondering how that works. I would appreciate any information you may have to guide me in the right direction. I just love that era of design. I have an old unfinised tapestry that was found but the colour and key charts are missing is there anywhere i can find these to complete this design please ? Hi, Margaret – I think you’d need to do an online search for the old kit, to see if it comes up through any sellers on eBay or Etsy or places like that. That’s the only thing I could see working, if you’re looking for a specific color key and chart. Next Next post: Au Ver a Soie Silks – New Colors Rolling Out!